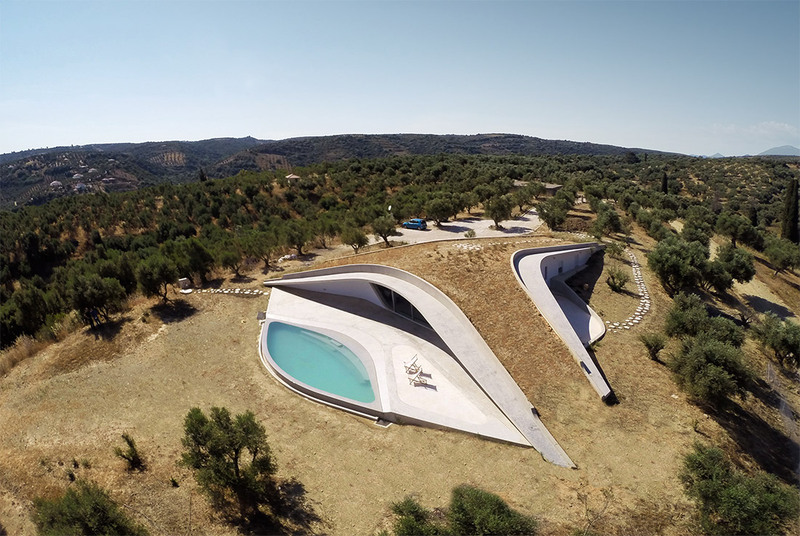 Villa Ypsilon is a summer residence nestled in a hillside olive grove in the southern Peloponnese designed by Theo Sarantoglou Lalis and Dora Sweijd of LASSA Architects. 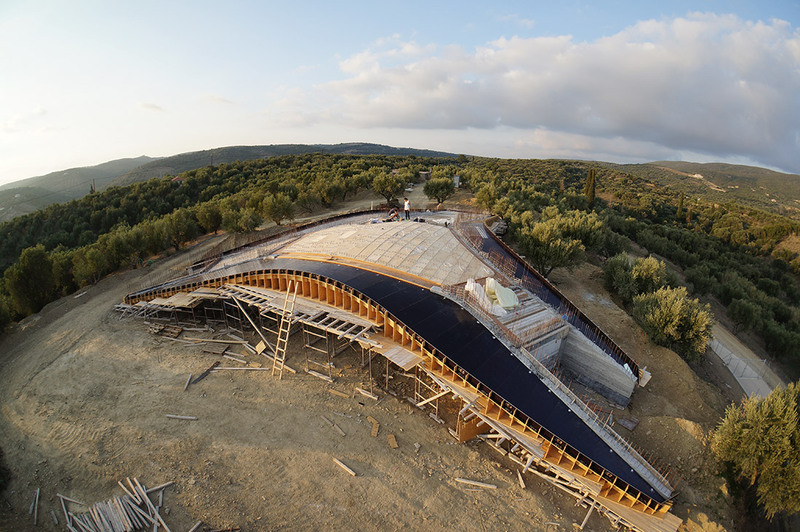 The villa is characterised by its green roof shell, acting as an accessible extension of the terrain, and framing the most significant views of the site from inside and out. The bifurcating pathways of the shell define three courtyards, forming distinct hemispheres with unique occupancy following the course of the sun throughout the day. The crest of the shell ties in with the hillside landscape; rising only to the height of the surrounding olive trees and integrating the foreground qualities with background vistas of the bay of Schiza and Sapientza, as well as mountain views toward the east. The interior is defined by two primary spaces – a more private area, with three bedrooms, two bathrooms and views to the east, and a common area toward the south with kitchen and living room areas providing balanced access to all three courtyards. 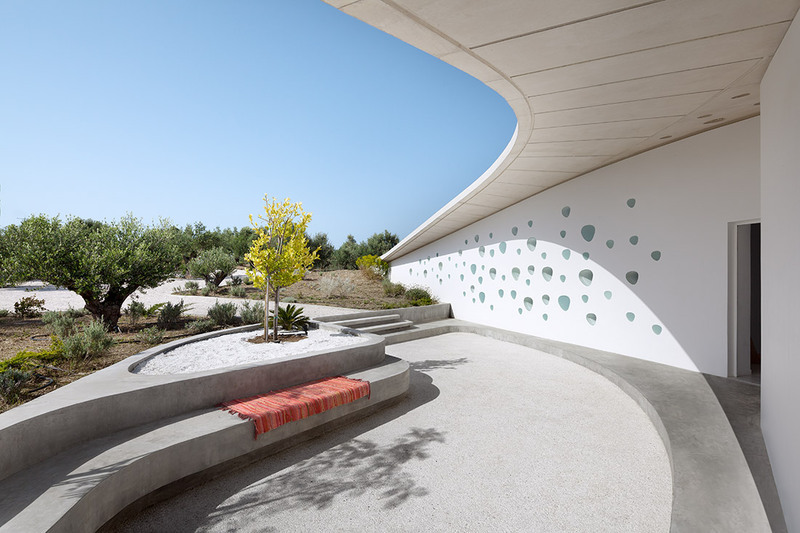 The organisation is designed so you may circulate with ease through, around and on top of the villa, establishing a continuous promenade that links indoor and outdoor activities. 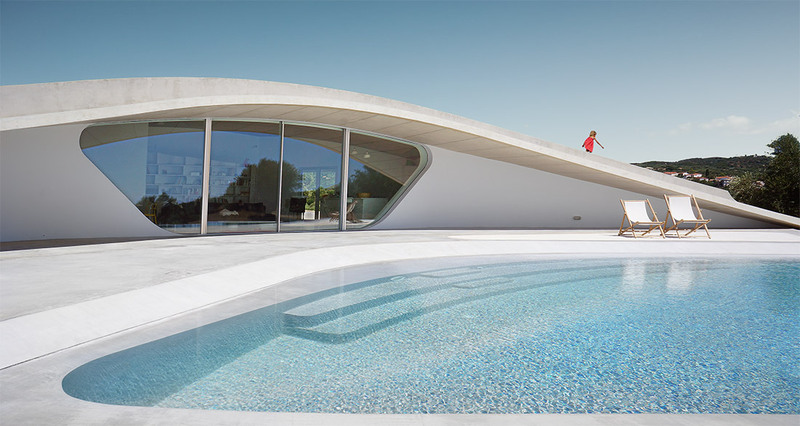 The villa Ypsilon brings together design that engages the body through landscape integration and an approach to architectural practice that aims to democratize bespoke construction through a consideration of economy and local materials and workmanship. 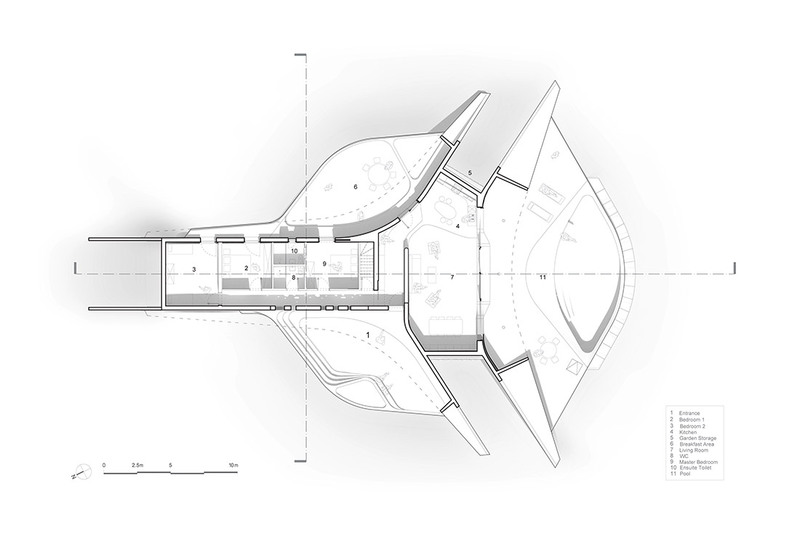 The remote location and project brief inspired a fabrication strategy that utilized large amounts of off-site prefabrication and self-assembly, minimizing construction time to 7 months within an affordable budget. 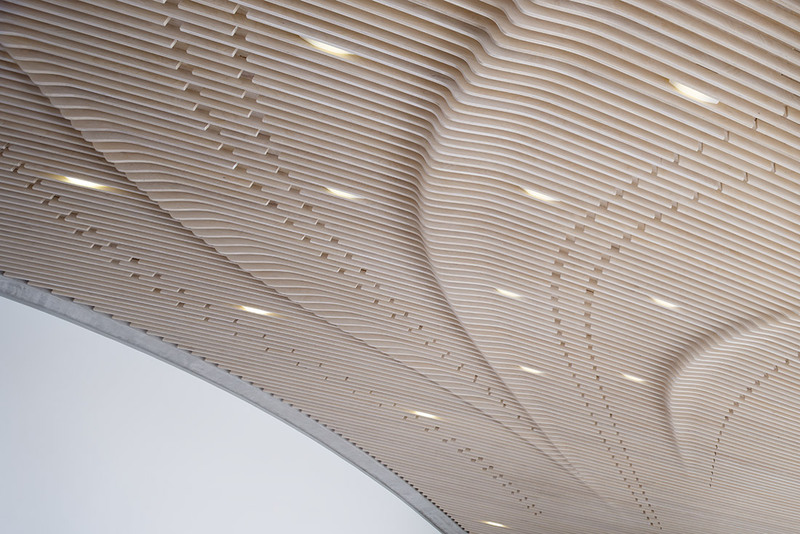 Extensive in office CNC (digital cutting machine) prototyping enabled the production of formwork for the concrete shell, furniture and bespoke window frames. The lost formwork of the shell is left in place after concrete was poured to become a spatial feature and provide acoustic dampening in the living room. This ‘hands-on’ approach allowed for minimal use of ‘off-the-shelf’ products, instead favoring locally sourced materials such as concrete, terrazzo and marble. The geometry of the concrete shell coupled with the planted roof and cross ventilation, strategy provides an environmental protection, which prevents the need for mechanical cooling and heating systems.